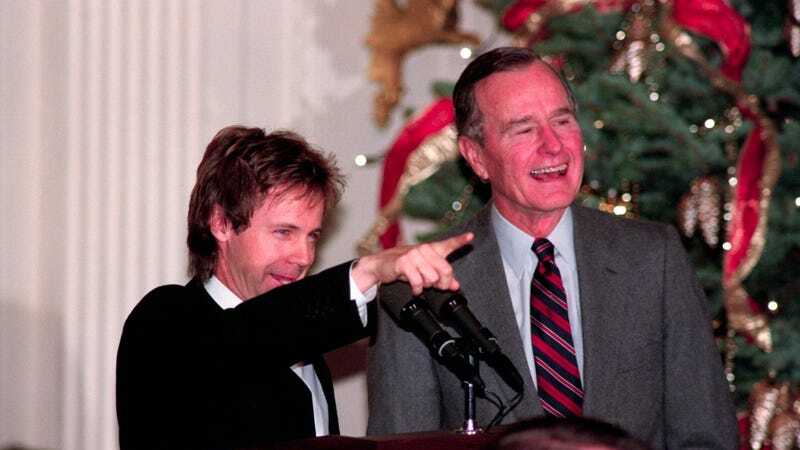 Dana Carvey and George H.W. Bush together in 1992. George Herbert Walker Bush, 41st President Of The United States, former head of the CIA, and, by necessity, a much-discussed, often-mocked figure in modern pop culture, has died. Bush was 94; his wife, former First Lady Barbara Bush, died earlier this year. As a pop culture site, it’s not really within our purview to discuss Bush as a politician or a statesman; he presided over a strange time in the American consciousness, the stern, stodgy-seeming single-term custodian sitting between the presidencies of two far more charismatic men, representing two very different eras of American politics and life. Indeed, Bush Sr. seems destined to be one of those incredibly important public figures who are nevertheless doomed to play second fiddle, not just to their predecessor or successor, but to themselves; somehow the impressions of Bush that flooded his time in office (and after) always seemed more real than the man himself. First among these, of course, is the one put forward by Saturday Night Live’s Dana Carvey, who probably did more to consign GHWB to a single span in the Oval Office (and a few easily stereotyped behaviors in the public memory) than any man alive. Picking out Bush’s fussy New England drawl, his waving hands, his tendency toward bombastic, slightly awkward phrases, and especially his slight air of constant uptightness, Carvey didn’t just mimic Bush: He transformed him, creating a caricature that often commanded more attention than the actual sitting president. (A decade later, Will Ferrell would do something very similar to Bush’s son.) Carvey played Bush as a walking ball of drop sweat, a humorless nerd who nevertheless insisted on cracking himself up with his own jokes. And yet, watching clips of Carvey’s impression now, it’s also possible to see why Bush himself was such a big fan of it. (Spurred by his amusement, the two men apparently became friends after Bush Sr. left office.) There’s an energy and vitality to Carvey-Bush that’s weirdly flattering in its way, the dynamism of a master comedian who’s found a character he can really sink his teeth into. Sometimes prissy, bordering on incoherent—as when sinking into his “Nah Gonna Doet” catchphrase—Carvey nevertheless made the man riveting to watch, something a politician has probably got to enjoy, even if it’s just by proxy. Carvey’s version was far more flattering, certainly, than what The Simpsons did with the same “material”; irritated at the Bush family’s occasional pokes—and really, what was so great about The Waltons, anyway?—the Fox sitcom fired back by making Bush a Springfieldite himself. The nasty brilliance of “Two Bad Neighbors,” from the show’s seventh season, is how little it focuses on Bush’s politics. (Which—despite the fact that his presidency oversaw the end of the Cold War, the formation of NAFTA, and the entirety of Operation Desert Storm—have been washed away over the years by a tide of “read my lips”es and the steady beat of time.) As writer Josh Weinstein later noted, the episode’s not an attack on Bush the president; it’s a rampage on Bush the man, who, in Harry Shearer’s hands, is transformed into a Flanders-loving, child-spanking, Homer-hating Mr. Wilson type. If Carvey hadn’t already banished the real Bush entirely from the public consciousness, Evergreen Terrace definitely finished the job. How the heck do you come back from “okily dokily,” huh? It’s of the nature of history, and of pop culture, to sand the edges off of everything it touches, to reduce them to their most easily imitable parts. Like (almost) any sitting president, George H.W. Bush was a far more complicated man than his public persona might suggest, doing both more good, and far more harm, than Carvey’s bumbling fussbudget, or Shearer’s humorless scold, ever could. And yet, it’s that collection of tics and catchphrases that persists, even—maybe especially—now that he’s gone. George Herbert Walker Bush, the president, the spy, the husband, the diplomat, the dropper of bombs, the ignorer of the poor and hungry, the humanitarian, and the man, is dead. George Bush the character lives on.